1 Looking to buy this Scorpion? 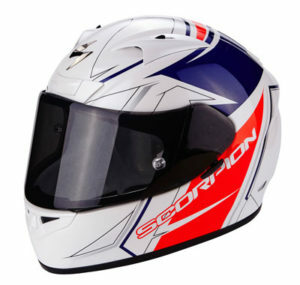 8 Best place to buy this Scorpion crash helmet? 15 Definitely want a Scorpion? 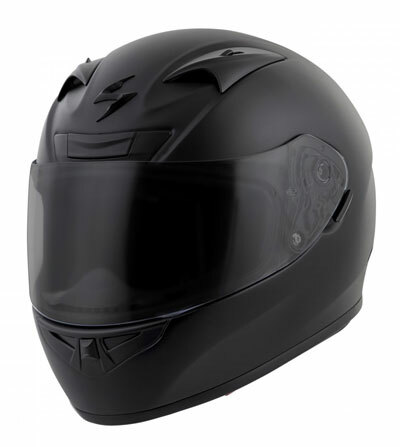 The Scorpion Exo-710 Air is a fibreglass-shelled full face helmet, designed with a nod towards the sportier side of riding. That’s because there’s a nice large visor on there that’s suitable for the more ‘lean-forward’ type of riding position that you’ll find on a sportsbike and because it’s been aerodynamically sculpted to reduce buffeting and wind resistance. It’s not an out-and-out full-on track helmet, but if you ride with your head tucked down from time to time and upright the rest, it might well be a good fit for you. 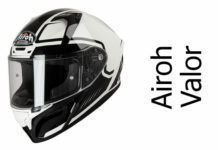 The 710 Air is available at a very attractive price point too, which puts this well-featured fibreglass helmet within the reach of most folks, whether using it for a daily commute all the way to a touring holiday. Here’s what the Scorpion Exo-710 Air offers and what owners think of theirs. Looking to buy this Scorpion? It's no longer widely available, but there were some good deals on Amazon the last time we checked. 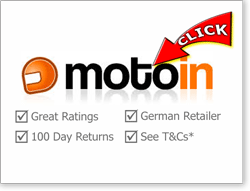 Or you can buy from Motoin who are a quality German operation with great online review scores, decent deals/discounts and a great range of Scorpions. Please see here for more info on our recommended stores or click the links above to go straight to their Scorpion helmets pages. The Scorpion Exo-710 is both ECE 22-05 tested/certified in Europe and DOT certified in the US (actually, it’s called the R710 in the states but it’s almost the same lid). As always, it’s worth being aware that getting a helmet that fits just right is your number one priority when buying a helmet – so make sure it fits spot on before worrying about a high Snell or SHARP rating. Which is where the 710 Air’s airpump system should come in. 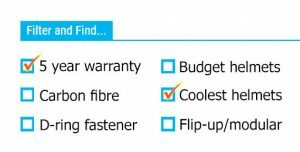 See more info on the comfort/fit section, but it means you can pump up the cheek pads so you can tailor the fit a bit and hopefully get your Air 710 to fit you just right. OK, so that’s the box-ticking done. But what other safety features are there on the Exo 710 Air? The 710 also comes with a Pinlock Max Vision anti-fog insert in the box: that will keep your vision clear when it’s cold and rainy, so that’s gotta be good for safety as well. It’s got a good old reliable double-d ring fastener to keep it tight on your head too. Oh, and it’s ACU gold stickered (UK only) meaning you can take it on the track in the UK. 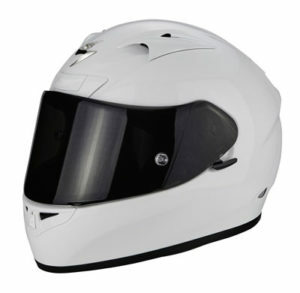 Plain white Scorpion 710 Air – note visor lock next to the visor. From all the comments we’ve found about the Scorpion Exo 710 Air, it’s about average for noise with about half saying it’s noisy and half saying it’s quiet (and lots of comments in between). There’s quite a few vents in the shell of the 710 Air. Up top, there’s three vents – one in the centre above the visor (2 position slider) and a couple of crown vents (again, a 2 position slider) – all relatively easy to find and operate in gloves once you’ve had a bit of practice. The whole thing seems to vent very well because we didn’t come across a bad word said by any owners about the ventilation. Lots of people said they can feel a ton of ventilation coming through and that the Scorpion 710 Air keeps their heads cool even on a long day of riding in the summer sun. Down below, the central chin vent has a 3 position slider; the fully-open position vents to both chin and visor, intermediate directs air towards the visor only, and there’s a fully closed position. These bottom vents are less effective, though used in conjunction with the supplied Pinlock Antifog, they keep the visor fog free under most normal circumstances. 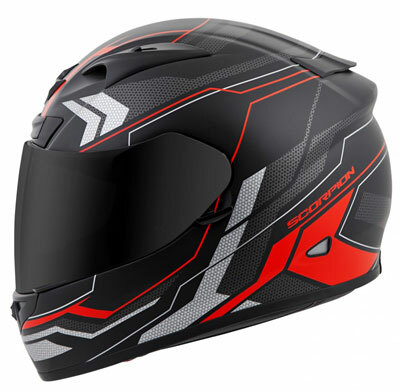 The Scorpion Exo-710 Air has Scorpion’s Ellip-Tec visor system. That’s a system that’s designed to pull the visor towards the rubber gasket when closed, making for a tighter seal that more effectively keeps rain, noise and wind out. It’s also designed to make the quick-change visor quicker and easier still – Scorpion reckons it takes about 10 seconds to swap out the visor. That’s quick and something I doubted – though one owner reckoned it takes him about 5 seconds so maybe it’s not that optimistic! The Ellip-Tec system works by using springs in the visor pivot to pull the visor away from the sealing gasket. Then as you raise the visor to the fully-open position, it pulls it back in again by a few mm towards the helmet. Clever. In Europe, the 710 Air comes with a Pinlock Max Vision-ready visor and Pinlock Max Vision antifog insert in the box. Unfortunately, the US version (called the R-710 over there) has neither of these; though it is EverClear anti-fog coated and comes with an optically correct visor, which the European 710 Air doesn’t have. It’s also worth noting that while there’s no sun visor on the Exo 710 Air, all clear visors made from polycarbonate have excellent anti-UV properties (broadly around 99%) – so while you might be squinting into the sunlight, you’re still actually getting a ton of UV protection. Finally on the visor system, the Exo 710 Air has a small lever bottom-left of the visor that’s there to either lock the visor closed or allow you to crack it open slightly. A few owners said they find this feature really useful. Note: all Scorpion Exo 710 Airs are sold with a clear visor – even though their promo shots show most with dark visors. Inside the Scorpion Exo 710 Air is a comfort lining made from a moisture-wicking, antimicrobial material that Scorpion calls its KwickWick2 liner. 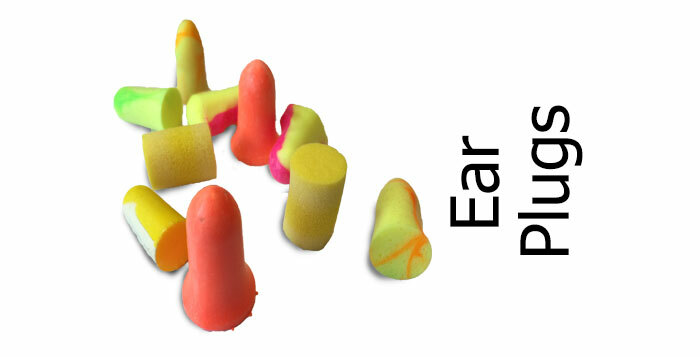 It’s also fully removable and washable. Note, the interior is one of the key differences between the European 710 Air and the US R710. The R710 available in the US is more like the old 710 in Europe in that it doesn’t have this AirFit system. It does however have EQRS – designed to help emergency services quickly remove the cheek pads (and therefore the helmet) after an accident. Again, the European 710 Air doesn’t come with EQRS (though the old 710 did). Inside both helmets, the shape/fitment of the Exo 710 Air is medium oval, which means it should fit most heads (unless you’re an overtly rounder headed person where you might find it a bit tight on the sides). Owners overwhelmingly like how comfy the Scorpion 710 Air is. OK, you’ve got to make sure it’s a nice, snug fit in the first place (follow our helmet fitting guide) but if the shape’s right and you buy the right size, other riders reckon it’s somewhere between good and very comfortable. That comfort level’s gotta be helped by its lightweight fibreglass shell. It weighs in around 1.35Kg (3lbs) which is well under the 1.49 average weight for a fibreglass full face helmet. And sure enough, several owners say it feels really light weight when they’re riding. Though remember – don’t try it on the road or remove any tags/stickers before you try and return it. There isn’t an online retailer in the land that’ll refund a helmet that’s not been returned in the same condition you took it out of the box – and that includes all tags, stickers and visor-vinyls. As usual, we’ve put a wide range of graphics up and down the page. Note: there’s both European Scorpion Exo 701 Airs and US R710s pictured on this page. You can tell which is which by the captions – or failing that the 710 Air has a Pinlock visor so you’ll be able to see the round Pinlock Pins on the visor. 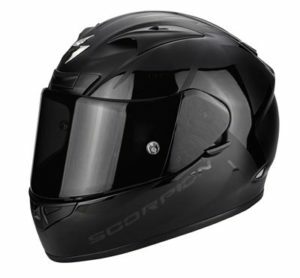 Best place to buy this Scorpion crash helmet? 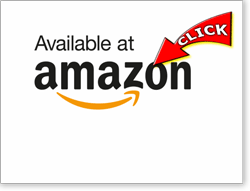 First off, we suggest you click this link to the Scorpion helmets pages at Amazon where you should be able to find a range of helmets to choose from - but make sure you only buy from the most reputable vendors. You should also try Motoin who are based in Germany, have decent Euro prices and get great feedback (4.7 out of 5 on eTrustedshops at the time of writing) though note, there's a delivery charge to ship outside of Germany, so factor that in (see here for details). 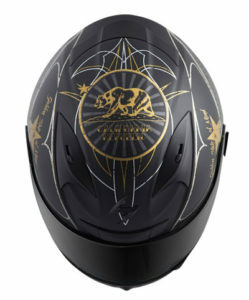 Please click any picture/link to drop onto their Scorpion helmets pages. And if you buy from them, we get a small sum from the sale at no extra cost to you - a massive THANKS! (it's how we finance the site). Click here for more info on our recommended retailers. Click above to drop onto their Scorpion helmets pages or *quick view retailer T&Cs here. Here’s a really quick 40s look around the 710 Air. The 710 Air comes with a double-d ring fastener. The Exo-710 Air comes with both a detachable breath guard and chin curtain installed. The Scorpion Exo-710 Air is well liked by owners and it’s not hard to see why. For not very much cash, you get a light weight, fibreglass full face helmet that’s versatile enough to work on sportsbikes and more upright motorbikes too. It’s got great ventilation and an innovative quick release visor system that comes with a Pinlock Max Vision antifog insert that’ll almost guarantee it won’t steam up, whatever the weather. And it’s got a good quality interior that includes Scorpion’s AirFit airpump system, designed to help you tailor the fit even more. 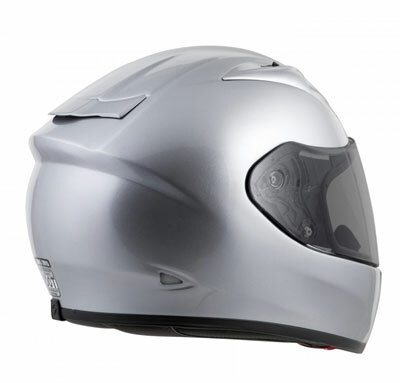 It drops a couple of safety points because it ‘only’ scored 3/5 in the SHARP helmet safety test (though it is DOT, ECE and Snell certified too). So if you’re looking for a great, light weight all rounder that’ll cover you for pretty well all types of riding but will give you change out of a couple of hundred quid, then the Scorpion Exo-710 Air is well worth trying out. 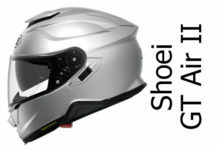 Shoei’s RYD is an excellent SHARP 5 star safety rated full face that’s got EQRS and has great ventilation. It’s a good chunk more expensive than the Scorpion though. This one’s the 710 Air in Furio design. 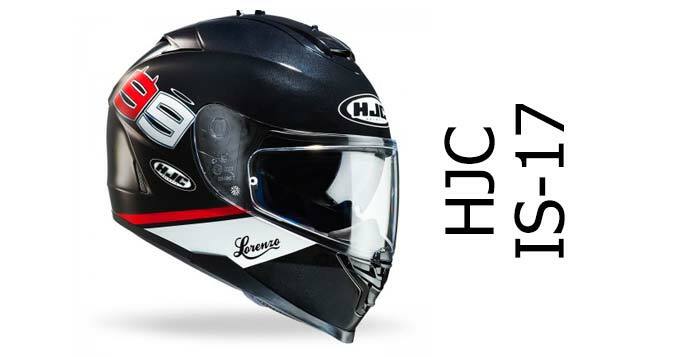 The HJC FG-ST isn’t though – that can be had for around the same money as the 710 Air; plus it’s SHARP 5 star safety rated, comes with a Pinlock in the box, has a fibreglass shell and has a drop down sun visor too. Proper excellent value for money that one! Or for a more unusual option, there’s the LS2 FF323 Arrow. 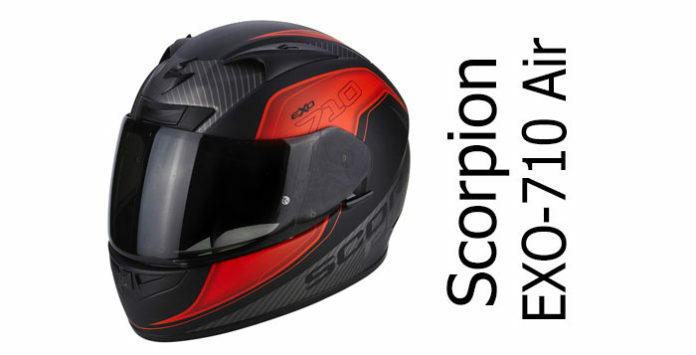 That’s a smidge more than the Scorp, but for the money, you’ll get a full on track-developed sportsbike helmet, that’s ECE, DOT and SHARP 4 star rated, has an optically-correct visor with a Pinlock Max vision, and it’s just as light as the 710-Air too. 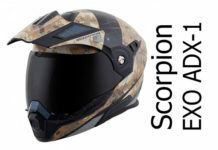 Here you'll find all our Scorpion crash helmet reviews and previews including full face, flip-up and open face helmets. The Scorpion Exo 710 Air give somes serious performance for not much money. 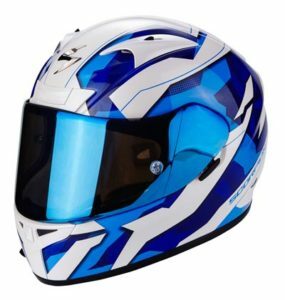 You get a light weight fibreglass helmet with a great visor system (including Pinlock Max Vision antifog), fantastic ventilation and an all-day comfortable interior. It's ECE and DOT certified as well as SHARP 3 star safety rated. In fact, apart from dropping those SHARP safety stars, it offers about as much bang for your buck as you could hope for. Well worth checking out.